Winter isn’t truly here until the first frost hits. And if your garden isn’t ready for it, it can make a brutal impact. 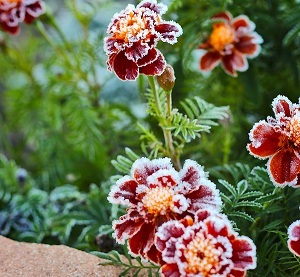 Your plants can be damaged or killed as the frost sets in, but don’t abandon all hope. In this article, we’ll go over what to do with plants that have already been damaged or killed by frost, as well as options to prevent frost as well as tips to avoid it for the future. All of which will help your garden better handle the seasons and be ready for spring. After a frost, you’re going to see a lot of damaged plants, filled with areas of brown and drooping foliage. Are they dead? Yes and no. When a frost hits, the water freezes in the leaf and stem systems, freezing delicate capillaries. This causes massive damage to the leafy tissues as well as desiccating the plant as water is frozen and then bursts from the plant. Where should you start? Don’t Start Pruning: We’ll go into more detail below, but don’t start ripping out or pruning plants until you can figure out how well they faired. Discard Warm-Season Annuals: If you’ve got marigolds or petunias, you can discard them now. Any warm season annual already had an expiration date on it. Wait and Keep Watering: Patience is a virtue. While you might think a plant is dead, try and wait a while and keep watering. You might be surprised. While brown leaves, wilted blooms, and drooping stems aren’t pretty, you’ll want to wait before you pull out those pruning shears. If you cut back to the living part of the plant, you might be making a bigger problem as the cold weather rolls in. Pruning stimulates the plant to grow, meaning your plant will start a new growth in the pruned area. A growth that will now be killed off in the next frost, while at the same time depleting the finite stores of energy the plant has to weather the winter. Instead, let it sit through the winter until the last frost passes before you get trimming. Your plants will thank you. Of course, just because you missed this frost doesn’t mean you have to miss future ones. While many options like covering your plants with fabric or plastics are dangerous to leave up due to overheating the plant, there are some tools to help, especially to preserve the heart of the plants: the root structure. Landscaping fabric and mulch helps to put down a layer of insulation to help the soil avoid freezing. Likewise, watering your plants each night can help them survive by acting as an insulator to help avoid desiccation in the cold weather. Learn more in our blog, How to Protect Your Plants from Frost Damage. At Greener Horizon, we’ve been providing landscape design and management throughout Massachusetts for years. We hope the above tips help you keep your landscape beautiful. If you need help with landscaping supplies such as mulch and landscape fabric, check out our Landscape Supply page, and make sure to contact us for your landscaping needs.